Need a SOLIDWORKS License? There are many varieties of SOLIDWORKS license available and they can be tailored to fit your needs. This article discusses the different license types and will assist you in finding the best solution. Contact our knowledgeable Technical Sales Team for more information. So what’s available? To start off, SOLIDWORKS goes far beyond a simple CAD software. 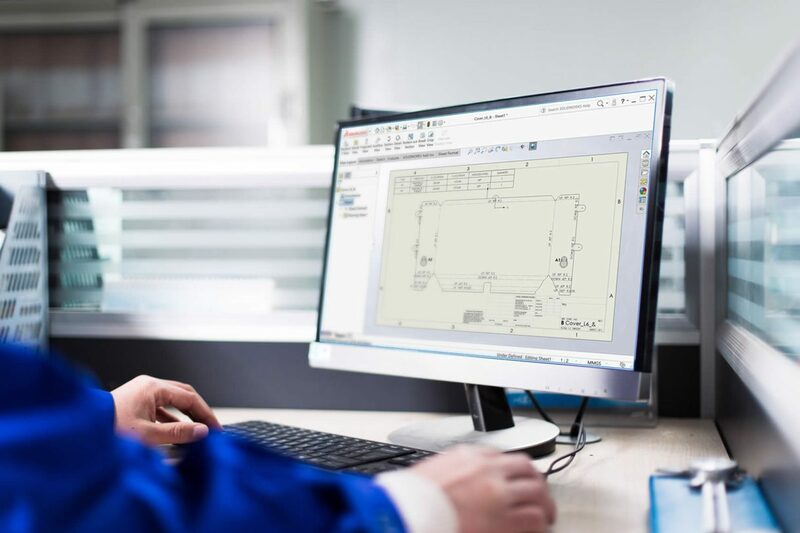 Within the same interface you can validate your designs by simulating real-world conditions, store and manage your data efficiently, communicate your ideas, program your CNC machine, apply quality controls with inspection tools, and much more. SOLIDWORKS Standalone License: If you have a designer that will always be using SOLIDWORKS on their computer, the Standalone license would be a good pick as it’s a license just for them. SOLIDWORKS Floating/Network License: If you have several designers but they won’t all be using SOLIDWORKS at the same time, the network license may be a better fit for your needs as it’s essentially a “pool” of licenses that can be shared between users. Standalone Standalone licenses have a serial number to be used by a single user. We can breakdown Standalone licenses into two further categories, Perpetual or Term licenses. SOLIDWORKS Perpetual License refer to a purchased license that is yours to keep. The software can be installed on a computer and continued to be used indefinitely. SOLIDWORKS Term License gives you the same features as a Perpetual license, but these have expiration dates so it can only be used during its purchased term. This has a benefit of lower upfront costs to get you started where there are budgetary constraints or if you only need it for a short period of time. This can be purchased as a 3-month or 12-month term. Most products are available for Term licensing but contact one of our sales specialists for details. Standalone licenses also give you the option to Activate on a specific computer, or use an Online mode where multiple computers are installed and you simply Log In when opening SOLIDWORKS to use the license. SOLIDWORKS Activation: Locks the license to an individual computer. It uses a hardware identifier so the license is tied to that particular machine. Once activated, you can always open SOLIDWORKS on this computer regardless of network or internet connection. To remove the activation from this machine (i.e. moving SOLIDWORKS to another computer or changing hardware) there is a transfer and deactivation process. Only one machine can be active at a time. SOLIDWORKS Online Licensing: provides the ability to automatically obtain the license when logging into SOLIDWORKS with an internet connection. Once you close SOLIDWORKS, the license is released. This allows you to install SOLIDWORKS on multiple computers and have easy access to the license by logging into SOLIDWORKS from one machine at a time. You have the ability to use Offline Mode to lock it to a particular machine in the event of travel away from an internet connection. SOLIDWORKS Network license combines multiple licenses into a single serial number. A small License Manager application is installed and activated on your server. This activation is only stored on the server that hosts all licenses. Client machines (user machines running SOLIDWORKS) obtain a license by looking to your server and uses a free license if available. When SOLIDWORKS is opened, it pulls the license from the server. When SOLIDWORKS is closed, it releases the license back to the server for others to use. Network licensing cannot use Online mode. You must be connected to the same network as your server to obtain a license. If you will be working offsite (i.e. with a laptop) and unable to connect to the network, you can borrow a SOLIDWORKS license from the License Manager. This uses a license from the server and locks it on the computer so a connection is not needed. You can register for a Home Use license with a network license only. This provides a separate node-locked license to be used on home computers by users. Please contact us for more information. Do you need a SOLIDWORKS License? Contact our Sales Team for more information about purchasing a SOLIDWORKS Standalone or Network license for your business.